This is your birth, a completely personal event. At the moment of your birth and the precious moments following, our focus is to allow you the fullness of this time together with as little interference as possible. Mother and baby are never separated and both are monitored and tended to together. We see birth as a normal part of a woman’s life and see the choices and authority of pregnancy and childbirth belonging to a woman and her family. As such, we play a supportive role, helping healthy women in experiencing birth as they envision it. In the Midwifery Model of Care, women and families are empowered through an informed and shared decision-making process. Care is evidence-based, holistic, and founded on the premise that women’s bodies know how to give birth and should be enabled to do so without needless intervention. Midwifery care is about the individual/family and her care providers, who together build a trusting, caring bond that supports a positive childbearing experience. We care deeply about each of our clients and enjoy coming to know every family that we are honored to serve. Available 24-7, our midwives are licensed by the state of Minnesota and highly skilled professionals. We offer comprehensive midwifery care for expecting families. Our center is unique in that we combine mainstream medical therapies with complementary and alternative medicine, the best of both worlds, all under one roof. We serve individuals and families through a variety of healing modalities. We also serve our clients beyond the pregnancy, birth and immediate postpartum stages. In our model of care, the childbearing woman has the central role, and we provide the supervision and care. We work hard to provide a safe, sensitive environment where you are truly heard. We spend time learning about your desires, challenges, concerns, and joys. We answer your questions about safety, choices for prenatal testing, and the process of labor and birth with the latest information available. For most pregnancies we recommend beginning care at 9-12 weeks. You will meet with a nurse and go over your history. She will also review some personalized recommendations for activity, diet and safety in pregnancy, as well as advice about common early pregnancy symptoms. Your initial lab work will be done at the visit as well. For the second half of this visit, you will meet with a provider which includes a basic physical. We will discuss any questions you have and discuss our plan of care. We accept most transfer patients. Please call us to discuss your situation so we can recommend the best way to begin your visits. You will be encouraged and supported in whatever way is most comfortable for you. You may choose to labor with the support of very few people and the monitoring of your midwifery team. Or you may see your birth as a family experience and family, friends, or support professionals you want to be with you are welcomed. We easily incorporate fathers, partners, and children into the process. Each of our birthing suites include large tubs that are available to you during labor. There are many benefits to laboring in water and our midwives are happy to support women who want to give birth in the tub to do so safely. We are very comfortable with and skilled in water birth. Postpartum care begins immediately. Moms, families and babies are never separated. We understand the postpartum time can be the most challenging time of all. Unlike typical postpartum health care schedules, the midwifery model of care recognizes the needs of the new family in the first few days and weeks at home. A nurse comes to your home at 24-36 hours for a home-visit. 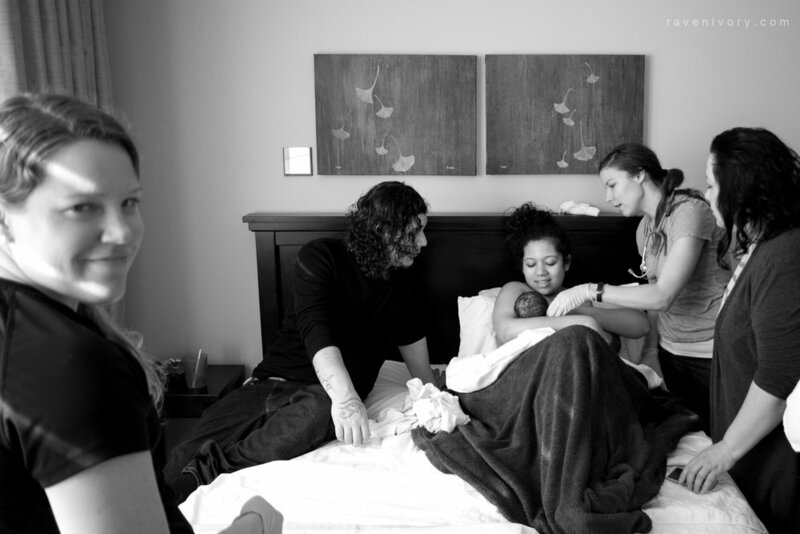 You will then have a two week and a six week postpartum visit with a midwife at the birth center. Nursing is natural, but it doesn’t come naturally to all moms and babies. Our providers will make sure you’re ready to breastfeed before you leave the birth center. Our IBCLC lactation specialist will also be there as you adjust to life at home and is available for lactation appointments at the Birth Center. Health Foundations is also a lactation center with a full product assortment that allows you to "one stop shop" for all your breastfeeding and lactation needs. You will find dedicated staff & bra fitters to help answer your questions.